The woodwork industry is modernising fast. If they haven’t already, successful business are actively planning to invest in a CNC based production process. With our background firmly rooted in this industry, we’ve developed a unique out-of-the-box CNC solution. The focus is small to medium woodworkers manufacturing custom projects. So as soon as you’ve taken your site dimensions, you can complete your design in Polyboard (cabinetry and other furniture), or StairDesigner. Unlike CAD, the software is parametric so much faster and less error prone. You then output the design to OptiNest which nests the parts panel by panel to minimise material waste. OptiNest send this information along with all machining details to VCarve to produce the actual code to run the machine. Once you’ve got your design, this whole process takes a few minutes at most. Because the MAXI-M3 is a nesting CNC, the parts are cut and machined in one operation and are ready for easy assembly (no need to cut the parts beforehand with a saw). Please get in touch to arrange a demonstration at Maxicam’s London showroom. 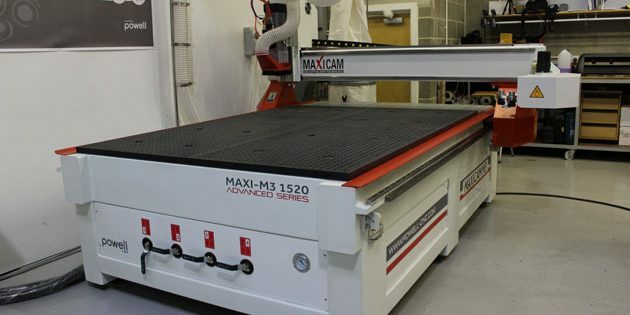 Click here to find out more about our wood CNC machine offers.